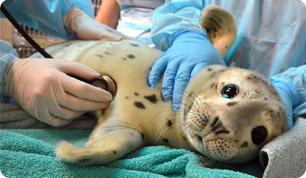 This northern elephant seal pup rescued from Point Arena in Mendocino County. He still had a full black coat, indicating he was very young, since elephant seals shed their black coats a few weeks after birth. He had become separated from his mother, and was dehydrated and malnourished upon admission to our hospital. Most pups are fed fish milkshakes (ground up fish mixed with multi-milk formula and salmon oil) until they are at least one month old, but Cueball was very unique because he started eating solid fish just five days after being rescued. Cueball’s spunkiness earned him the Center's title of Animal of the Year. Within a month of his rescue, a fat and healthy Cueball was released at Point Reyes National Seashore. Thank you for your generous donation and for making a difference in the life of a marine mammal like this former patient.